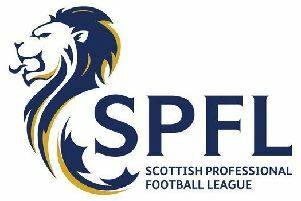 Seventh placed Bellshill Athletic were back in Ayrshire for the second Saturday running when they travelled to face bottom of the league Lugar Boswell Thistle, writes Eddie Lynas. And, after the previous week’s 0-0 draw at Ardrossan Winton Rovers, there was to be another draw on this occasion as the McBookie.com League Two match at Lugar ended 1-1. The game kicked off at a frantic pace with the home side fielding five 16 or 17-year-olds in their starting 11. Lugar found themselves in front after just six minutes when a seemingly harmless cross from the right wasn’t dealt with by the Bellshill defence, allowing number seven Mclaughlan to rise unchallenged and head home to put the home team 1-0 ahead. The Lugar youngsters continued to attack a Bellshill rearguard who looked out of sorts for the first 20 minutes. But things were about to get significantly better for the away team. For a long clearance from Brand dropped perfectly for Jamie Stewart to volley home the equaliser from distance with a truly wonderful finish which made it 1-1. The visitors created a few more chances to take the lead but again they couldn’t finish and both teams went in level at half-time. Early in the second half Bellshill were facing the same scenario as last week when a silly foul saw Conroy pick up a second yellow card and he was sent off, leaving 10 men to cope with the constant pressing from Lugar. But Bellshill changed things round with Nicol, Savarese and Brannigan replacing Goodman, Brennan and Stewart. At this point the game was in danger of erupting due to silly skirmishes and some very poor refereeing from Mr Simmons but common sense returned with the final whistle and the game ending 1-1. Bellshill have to pick themselves up for the vist of league leaders Gartcairn to Rockburn Park tonight (Wednesday), kick-off 6.30pm. ’Hill also have a home league game this Saturday, kick-off 2pm against Shotts Bon Accord. 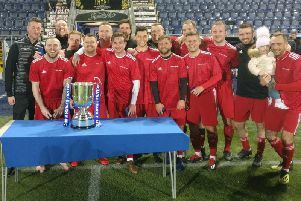 Colville Park AFC win M and M Cup and reach Scottish Amateur Cup final!